See what's up in the night sky for April 2019, including stargazing events and the moon's phases, in this Space.com gallery courtesy of Starry Night Software. In the western evening sky on the evenings around Monday, April 1, Mars' eastward orbital motion (orange line) will carry it three finger widths to the left of the bright open star cluster known as the Pleiades, the Seven Sisters, and Messier 45. For best results, view the pairing in binoculars (red circle) while they are higher in the sky — before about 9 p.m. local time. From time to time, the small round black shadows cast by Jupiter's four Galilean moons become visible in amateur telescopes as they cross (or transit) the planet's disk. On Monday, April 1, observers in the western Americas and the Pacific Ocean region can see two of those shadows on Jupiter at the same time. At 11:52 GMT, Ganymede's shadow will join Europa's shadow already in transit. The two shadows will cross Jupiter's northern hemisphere together for 66 minutes until Europa's shadow moves off the planet at 12:58 GMT. Ganymede's shadow will continue to transit Jupiter for another hour. 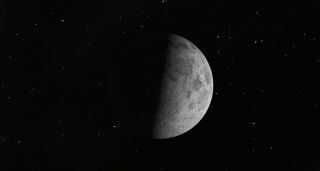 Low in the east-southeastern sky before sunrise on Tuesday, April 2, the very old crescent moon will be visible sitting four degrees below bright Venus. The pair will fit within the field of view of binoculars (orange circle). A tricky-to-see extra bonus will be much dimmer Mercury sitting 8 degrees to the moon's left — and distant Neptune half of a degree below Mercury! At its new phase, the moon is traveling between the Earth and the Sun. Since sunlight is only reaching the side of the moon turned away from us, and the moon is in the same region of the sky as the sun, the moon is hidden from view for Earth-bound observers. A day or two after new moon, look for the slender sliver of the young crescent moon just above the western horizon after sunset. On Monday, April 8, the dwarf planet Ceres, named for the Greek goddess of agriculture, will cease its eastward motion through the distant stars (red curve with dates) and commence a westward retrograde loop that will last until mid-July. Ceres' visual magnitude of 8.0 will allow it to be seen in binoculars and amateur telescopes in the southern sky between about 1 a.m. local time and the dawn twilight. The asteroid's position on April 8 will be among the stars of southern Ophiuchus, approximately 11 degrees to the upper left (northeast) of the bright star Antares in Scorpius. In the western sky on the evening of Monday, April 8, the waxing crescent moon will land 7 degrees below reddish Mars. On the following evening, the moon's orbital motion will place 9 degrees to Mars' upper left. At the same time, look for the bright, orange star Aldebaran sitting 7 degrees to the left of Mars and the bright little Pleiades Cluster a palm's width to the lower right of Mars. On Wednesday, April 10, the main belt asteroid designated (2) Pallas will reach opposition, its closest approach to Earth for the year. On the nights around opposition, Pallas will shine with a peak visual magnitude of 7.9, well within reach of binoculars. As a bonus, the asteroid will be situated only 0.25 degrees (half the full moon's apparent diameter) to the lower left of the bright double star Murphrid, which is also designated as Eta Boötis (η Boötis). They will easily fit within the field of view of a backyard telescope. (Your telescope will mirror and/or invert the inset view shown). The asteroid and star will already be climbing the eastern sky after dusk and will spend the night crossing the sky together. For most of this year, the bright planet Jupiter will travel within the constellation of Ophiuchus, the Serpent-Bearer. On Wednesday, April 10, Jupiter will cease its regular eastward motion in front of the distant stars and begin a retrograde loop (red curve with dates) that will last until early August. The apparent reversal in Jupiter's motion is an effect of parallax produced when Earth, on a faster orbit, passes Jupiter on the "inside track." On Thursday, April 11, Mercury (orbit shown as a red curve) will reach its widest separation 28 degrees west of the Sun. Due to Mercury's position well below a slanted morning ecliptic (green line), this will be a very poor pre-dawn apparition for Northern Hemisphere skywatchers, but a very good one for those viewing the planet from the Southern Hemisphere. At first quarter, the relative positions of the Earth, sun, and moon cause us to see the moon half illuminated — on the eastern (right-hand) side. First quarter moons rise around noon and set around midnight, so they are visible starting in the afternoon hours. The term quarter moon refers not to its appearance, but the fact that our natural satellite has now completed the first quarter of its orbit around Earth since the last new moon. In the southwestern sky after dusk on Saturday, April 13, the waxing gibbous moon will be positioned a few degrees to the left of the large open star cluster in Cancer known as the Beehive, Praesepe, and Messier 44. Binoculars will encompass both the moon and the cluster in the same field of view (orange circle), but to see the clusters' stars, position the moon just outside of your binoculars' field of view. A few hours earlier, at approximately 19:30 GMT, observers in Western Europe, the Middle East, and eastern Africa can see the moon's orbit (green line) carry it directly through the cluster.